Peter Summers will forever be remembered for leading the club back to Moorabbin. Stay united, stay involved, stay passionate. Our time will come. St Kilda President Peter Summers’ time at the helm officially came to an end at the Saints’ Annual General Meeting on Tuesday night. Summers handed on the reins to Seek co-founder and CEO Andrew Bassat, one of Australia’s leading business minds. Born in the Saints’ premiership year, Bassat is a staunch and passionate St Kilda person, and he was unanimously elected by the Board after a thorough succession planning process. As Bassat accepted the role on Tuesday night, he paid tribute to Summers’ leadership. “The club is a vastly different place to when Peter Summers joined the Board,” Bassat said. As a result of the building blocks put in place under Peter’s leadership, we now have the luxury of focussing single-mindedly on being successful on the field." 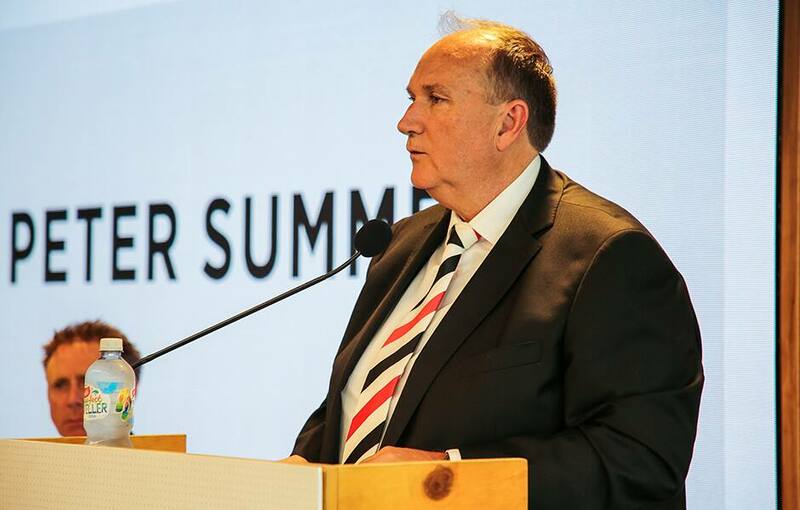 “We have overcome a series of significant obstacles; returning to the club’s spiritual home in Moorabbin, entering into a vastly improved stadium agreement and growing other areas of the business from a standing start when Peter joined the Board. “In my short time on the Board, I have been very impressed at Peter’s selfless dedication to the role, including for example his willingness to meet with so many supporter groups over the course of the season. Bassat presents Summers with a guernsey signifying his 50 years of membership. After nine years served as a Director on the Board – five as President – it’s the return to Moorabbin that Summers will be best remembered for. The relocation to a $30 million facility at the club’s spiritual home is arguably the most important moment in the club’s recent history. Backed by community football partners, the state government, the AFL and a donor-funded groundswell, Summers led the once seemingly impossible task of ensuring the return to Linton St was financially viable. Supported by partner Karen Masson, Summers spent countless hours building and fostering relationships with St Kilda people and businesses – all while juggling his duties as CEO of AVJennings. Years of work towards this goal culminated in St Kilda ultimately shifting its operations and training base back to Linton St from Seaford in March, 2018. Thanks to Summers and many other passionate St Kilda directors and supporters, St Kilda players now benefit from arguably the best training facility in the league, a state-of-the-art headquarters at RSEA Park that will go to another level next year with the addition of Stage 2. In Summers’ final address as President at St Kilda’s Annual General Meeting on Tuesday night, he addressed his fellow Saints members directly. “From one member to all you other members, I can assure you your club is one you should be proud of,” he said. “It’s been an honour and privilege to have been able to represent and serve the club I love. Summers spoke of trust being an integral ingredient to winning a premiership; trust in the players, trust in the club, and trust in each other. And true to his style, his final words as President were a call to arms.